The Leesiders were held to a 0-0 draw by Bohemians tonight. Oscar Brennan is tackled by Gearoid Morrissey. Cork City’s title celebrations have been put on hold until Monday at least after their 0-0 draw at a rain-drenched Dalymount Park tonight. On the brink of securing a first Premier Division in 12 years, the Leesiders travelled to Dublin to face the side that ended their 22-game unbeaten run earlier this year. And while they started brightly, Bohemians looked the most likely to score in the second half. Dundalk’s 1-0 win at home to Bray Wanderers means Cork now need just one point from their three remaining fixtures. The Gypsies hadn’t played since getting the better of St Patrick’s Athletic in a five-goal thriller a fortnight ago, and Keith Long made three changes to that team. With Lorcan Fitzgerald and Warren O’Hora injured, Dylan Hayes and Dan Casey were named in the backline as captain Derek Pender switched from right full-back to the left. Oscar Brennan, meanwhile, replaced the suspended Keith Ward behind lone striker Dinny Corcoran. After taking a knock during the week, Conor McCormack was assessed late but the Cork midfielder, who has been one of the team’s driving forces this season, was only deemed fit enough for a place among the substitutes. In came Greg Bolger to captain City, while Jimmy Keohane was named at right back with Conor McCarthy dropping to the bench. Cork were lively from the off and the first real chance of the evening saw Kieran Sadlier cut inside onto his left and send a strike just past Shane Supple’s near post. The visitors continued to probe and had what looked like a stonewall penalty turned down by referee Robert Harvey on 17 minutes. Garry Buckley won possession from Fuad Sule and off-loaded to Bolger. His through-ball gave Karl Sheppard some work to do but the striker raced onto the pass and got a touch ahead of the onrushing Shane Supple. Sheppard was taken out by the Bohs keeper inside the box as the roars went up from the travelling supporters situated in the Des Kelly Carpets Stand. Ryan Delaney had a header that was caught easily by Supple after a corner had been recycled, while — down the other end — Paddy Kavanagh worked some space to cross for Corcoran but his headed attempt didn’t trouble Mark McNulty. So the sides went in at the break all-square and you wondered whether John Caulfield’s men would have to wait until Monday’s game with Derry City to get the job done. Long brought Philip Gannon on for Byrne at the beginning of the second half, and his team started to really threaten. After Buckley had blazed over the Bohemians bar from distance, they created an opening with Corcoran and Brennan combining to find Paddy Kavanagh, but his deflected shot was stopped by the body of McNulty. Moments later, Pender went on a run down the left flank and tried to squeeze a shot in at the near post. The resulting corner fell to substitute Gannon but his effort was blocked. Bohs grew in confidence and a super ball from Brennan then picked out the run of Ismahil Akinade, who rounded McNulty but saw his goalbound attempt cleared off the line by Shane Griffin. The two players were involved in the second penalty shout of the evening as Akinade went down under pressure from Griffin, but this time the decision to play on looked the correct one. Corcoran headed a couple of yards wide off-target fine work from Kavanagh, and Dooley sent a shot high and wide as the two sides went in search of a winner. There were chances at both ends in the closing minutes and late substitute Ian Morris forced McNulty into a decent save. But neither managed to break the deadlock and attention now turns to Monday night, when Cork can wrap things in front of their home fans at Turner’s Cross. Bohs, meanwhile, are officially safe in the top flight for another season. BOHEMIANS: Shane Supple; Dylan Hayes, Rob Cornwall Dan Casey, Derek Pender (c); Ismahil Akinade, Fuad Sule (Ian Morris 90), Dan Byrne (Philip Gannon 46), Paddy Kavanagh, Oscar Brennan; Dinny Corcoran. CORK CITY: Mark McNulty; Jimmy Keohane, Alan Bennett, Ryan Delaney, Shane Griffin; Greg Bolger (c), Gearóid Morrissey; Kieran Sadlier (Conor McCarthy 65), Garry Buckley, Stephen Dooley; Karl Sheppard (Achille Campion 88). Email “Title not yet in the bag as Cork City draw a blank at Dalymount”. 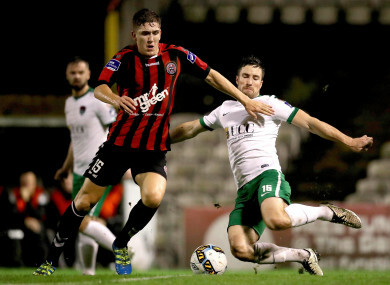 Feedback on “Title not yet in the bag as Cork City draw a blank at Dalymount”.